Portraits of the most famous and esteemed members of the Polar Bear Explorers’ Club adorn its entrance hall; ‘They were all men, of course, and they all seemed to have a penchant for monocles and morose moustaches’. Nothing could be more British – indeed, English – including Alex Bell’s good-natured mockery of male self-importance in what feels like a late Victorian or Edwardian setting. 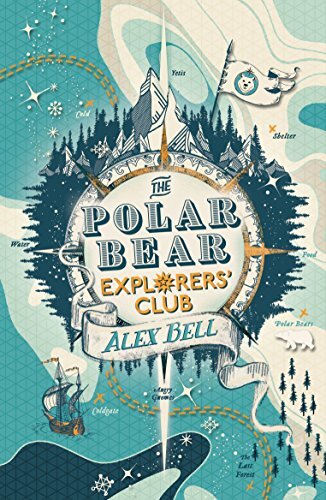 In fact, we’re never limited to any real-world locations or dates, which allows Bell’s characters to embark upon perilous adventures in a Frozen North where anything goes – carnivorous cabbages, untrustworthy trolls, ice palaces, yetis, mammoths and unicorns and whatever else Bell thinks might tickle the fancy of young readers. Tomislav Tomic’s images enhance the plot’s icy dangers, offering many intriguing details to explore. The book begins with twelve pages of Rules of each of the world’s four great Explorers’ Clubs. An adult reader might find the humour of this prelude to the novel repetitious, but this would be to ignore the enjoyment readers of this age group find in re-worked jokes as they grow accustomed to a writer’s tongue-in-cheek verbal games. There is intense rivalry between the Desert Jackal, the Jungle Cat, the Ocean Squid and Polar Bear Explorers’ Clubs, reminiscent of that between Houses in early 20th Century public school stories. All the Clubs are run by elderly chaps untroubled by doubts about their innate superiority and status. One of the very occasional exceptions is Felix, a fairyologist by profession and the adoptive father of our heroine, Stella Starflake Pearl, whom we meet on the eve of her twelfth birthday. Felix found her, just a couple of years old, abandoned in the snowy wastes of the Icelands on one of his expeditions. He has made a home for her which delights them both. Stella has no conscious memories of life before Felix, though she’s visited by recurring dreams worthy of one of the Grimms’ most unsettling tales. Stella longs to go on an expedition herself and, but for the rules of the Polar Bear Explorers’ Club, Felix would gladly take her. To no reader’s surprise, they get around this little difficulty, and soon she finds herself sailing North aboard The Bold Adventurer, joining three boys who have little in common with her or each other. There’s Beanie, who is part elf, which may account for his powers of healing along with his dislike of ‘small talk, sarcasm, handshakes, hugs and haircuts’; Shay, who’s a decent fellow, a reliable leader with an inborn talent for handling the wolves one needs to pull a sled in the Icelands; and Ethan, a magician and also an Ocean Squid Explorer with a loathing of all things Polar Bear, whose initial prickliness stems from a troubled family history which unfolds along with the adventure. In the time-honoured tradition of R.M. Ballantyne’s Coral Island, Arthur Ransome, C.S. Lewis et al, the young people are swiftly separated from the adults and must rely upon their own resources. Through their knife edge adventures they learn loyalty and friendship, revealing their vulnerabilities along the way. Encounters with duplicitous frosty fairies with a taste for human fingers and outlaws holed-up in the ramshackle ‘Yak and Yeti’ drinking saloon in the middle of a frozen wilderness prepare them to some degree for their final test. Now Stella must confront temptations linked to her own origins; she is invited to wield powers over others which are both cruel and absolute. The loyalty and friendship between the children brings them back to safety and re-unites them with ‘the waxed moustaches and fussy beards and puffy sideburns’ of the still-squabbling grown-ups. Finally home, Stella snuggles down in bed with Gruff, her pet polar bear and Buster, the pygmy dinosaur, for comfort and company. But deep inside a suitcase she’s brought back from the Icelands, Something Nasty stirs, surely promising further desperate adventures.